Presented in UK English, this compact NIV Bible can be taken with you, wherever you go. The ultimate travelling companion. Looking to discover how the Bible can speak to life today? The NIV Life Application Study Bible is specifically designed to help you study and apply the Bible to everyday life. The perfect Bible study or small group resource. This compact edition has British spelling, grammar and punctuation. Bible text size 7.25pt. 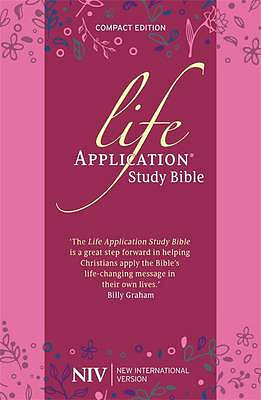 NIV Compact Life Application Study Bible (Anglicised) Soft tone by New International Version was published by Hodder & Stoughton General Division in February 2019 and is our 6764th best seller. The ISBN for NIV Compact Life Application Study Bible (Anglicised) Soft tone is 9781473651609. Be the first to review NIV Compact Life Application Study Bible (Anglicised) Soft tone! Got a question? No problem! Just click here to ask us about NIV Compact Life Application Study Bible (Anglicised) Soft tone. A:This Bible has a height of 198mm, a width of 129mm and a text size of 7.25pt. Thank you for using the Q&A Forum. What is actually printed on the front Cover? Is the darker strip printed on or is it a removable fly leaf? I have seen this bible (same picture) advertised on Amazon as having a flexibound cover. Is this flexibound or paperback as described? A:This Bible will be flexi-bound, soft tone, covered. Thank you for using the Q&A Forum.